Spring, Texas – February 22nd, 2017: Crews from the Texas Department of Transportation are currently on the scene of a large pothole on the northbound mainlanes of I-45 near Hardy Toll Road. The crews are making emergency repairs on a pot hole approximately 6 foot wide. Sources tell us that the pothole left more than 10 vehicles stranded with blown out tires and damage to their vehicles. Roadways surrounding this incident are at a complete standstill. 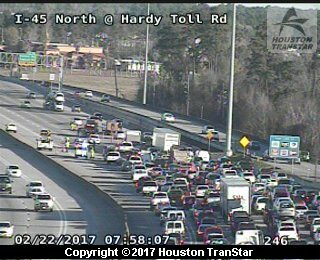 I-45 is a parking lot from Hardy Toll Road to FM 1960. The Grand Parkway eastbound is backed up for miles as folks are trying to get on the I-45 connector ramp.